Posted December 10th, 2012 by Sarah. Hello! 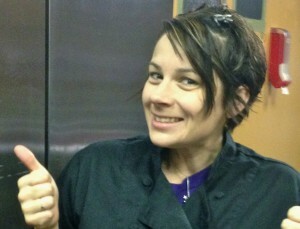 My name is Sarah and I am a chef and owner of a local catering company. I started Low Carb Zombie as a way to record all of my recipes and share them with others on a low carb journey. I had my first child at the young age of 19, and after giving birth, something strange happened. I was HUGE!!! My baby weight did not go away, in fact, by the time my daughter was 1, I had gained 20 more pounds on top of the baby weight! I decided one day that enough was enough. For the first time in my life, I went on a DIET! It wasn’t so bad… I bought whole wheat bread, ate lots of potatoes and rice. I bought diet everything! Baked lays chips, diet ice cream, even those little microwave pizzas for people that are on a diet. After a few months… nothing had happened! NOTHING.. I did not lose one pound! My father, who is diabetic, had been on a low carb diet for quite some time to control his blood sugar. He suggested that I try it to lose weight. I really thought it was ridiculous… Eating fatty beef and bacon.. and not eating whole grains and 100 calorie packs all day. I scoffed and continued on with my “diet”.. ignoring his advice. Since then I have maintained my weight and I will never be fat again. It takes work to lose it, mostly discipline and breaking carb addiction habits. Since I have lost the weight, I can enjoy carbs once again… just in serious moderation. Most of the time, I make my own low carb versions of our favorites and I try to keep my kids on the right track and eating healthy. I love this way of life and I will never go back. I find joy in being in the kitchen, creating low carb concoctions that mimic the taste of store bought foods. I love creating something and saying YES! this would sell, even for people NOT in the low carb way of life. When I make a truly amazing recipe, I place it on the menu in my Catering Business as well, where I can get reviews from my clients and tweak recipes accordingly. I love the science of food, from ingredients and how they fuse together to create different tastes and textures, to cooking methods and sweeteners and spices. I also enjoy continued learning on subject of health, paleo, low carb, primal eating, and how the foods that we eat directly impact every aspect of our body. I love food, and I love making food. I hope that you enjoy this site, and sharing these recipes with your loved ones. I love your site!, As a low carb eater who “fell off the wagon” this holiday and gained 8lbs, I needed a kick start to the same ole things and go to’s of my regular low carb life. cannot wait to try these recipes !